Approximately every 40 seconds, an American will have a heart attack (MI). The estimated annual incidence is 605,000 new attacks and 200,000 recurrent attacks. Of these 805,000 first and recurrent events, it is estimated that 170,000 are silent. The average age at first MI is 65.6 years for males and 72.0 years for females. But heart attacks and strokes don’t just happen to the elderly. Research shows that heart disease death rates are declining more slowly than they have in the past, especially among adults age 35 to 64. In many communities across the U.S., cardiovascular disease death rates are increasing among adults age 35-64 and their rates of risk factors, such as physical inactivity, tobacco use and hypertension, are also increasing. 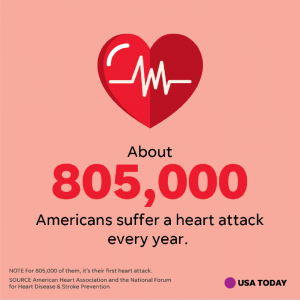 By being more physically active, eating healthfully, and being tobacco-free, the US can prevent 1 million heart attacks and strokes in 5 years.